The New York Downtown Hospital’s Global Philanthropy Award is granted to non-profit or private organizations or to individuals, whose philanthropic activities have the ability to reach and assist communities and people both at a local and a global level. The award focuses on the fields of health and medicine, and aims to emphasize the critical role philanthropy plays in supporting health and medicine-related issues worldwide. 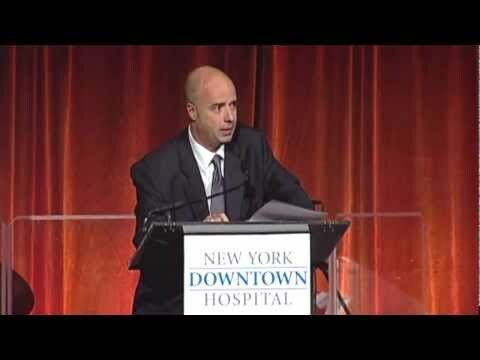 In selecting the Stavros Niarchos Foundation as the award’s first recipient, the NYDH recognizes the organization’s extensive and far reaching social impact throughout the world, as well as the SNF’s significant contributions in the area of health and medicine, including the foundation’s support of New York Downtown Hospital. In 2008, the Stavros Niarchos Foundation supported NYDH’s acquisition of a state-of-the-art digital mammography machine for the purpose of improving patients’ access to breast cancer early detection services. The purchase of the mammography equipment has allowed the hospital to enhance its Women’s Health Initiative program, as part of its recently established Comprehensive Prevention and Wellness Center. In 2010, the Foundation supported the hospital’s renovation and expansion of its Surgery Intake and Registration areas. The SNF’s support has contributed significantly in the efforts of Lower Manhattan’s only hospital to improve and provide better care for its patients and the local community by addressing issues of overcrowding and overcapacity and by increasing, consequently, the safety and comfort of its patients.